Looking for any one that has used the Milwaukee cordless miter saw and your thoughts. I've read some good reviews online, but don't see any one talking about it here. Been eyeballing it for some time and it really fits my work flow and work load. Would still have the DeWalt 12" for larger crown and base or for large jobs. Just looking for real world, real professional hands on experience. Almost snagged the last one at my Home Depot today but walked away. There was a post in the TBA thread about a month or so ago. All I can offer is make sure you get two batteries with it as the promo from Home Depot. "10 in. dual bevel sliding compound miter saw, blade wrench, carbide tipped blade, dust bag, clamp, (2) REDLITHIUM high demand 9.0 Ah battery 48-11-1890 , M18 and M12 rapid charger"
I tried it at a tool show, was very impressed with the fit and finish and how smooth it cut. Only thing that concerned me was that the rails were at the bottom of the saw (unlike all the others I've used with rails above) located right where all the sawdust would go. My concern was that the rails might get gummed up easily over time from sap/pitch. Well I went and pulled the trigger earlier. First impressions were good. I cut some 2x4 and it cut with ease and seems to cut pretty nicely. Two things I'm not too hot about though. First, If you want to do a 45* bevel to the right side, you have to take the right side fence off. The damn body won't clear the fence. I will take a pic later and show. VERY lame design if you ask me on that one! Next is the vertical cut capacity. They claim 5 3/4" and yes, it will cut that, but only on a straight cut. You can't get through 1 or 2x6 beveled. That one has me a bit pissed off and may consider returning it if I cant cut 5 1/2" mitered vertical. A bit misleading. I tried both 1 and 2x and neither will go all the way. Oh, and there seems to be a third gripe! Crown stops. They mention them in the manual and give a catalog #, but they don't seem to exist. Haven't been able to find them online anywhere yet. So as of right now I'm a bit mixed. Like the rest of the saw and how it feels, but they seem to have missed in just a couple of little spots. I have one. I like it. I don't have any real complaints. Even Festool couldn't get that right. When you say "beveled" in this context, do you mean miter? Although stupid, I'd bet if you did a straight cut first then did the miter cut that you could get the full vertical capacity at a 45 miter against the fence. Compared the almost nonexistent fence on my hitachi I thought it was clever how they were able to put such a tall fence on a 10" saw for doing crown in position. I could see how removing top portion of the fence would be anoying if you're coming from a 12" saw though. I'm sorry, yes, I meant mitered. So 2 cuts in order to make one? Doable, but twice as many steps. Makes it a bit counter productive no? Will play with it some more and see how I feel. Just my initial impressions. there are many things to like about the saw. Light weight compact design. Shadow line, easy to use bevel and miter controls, no safety, easy to hold guard up with finger to make long bevel cuts, powerful enough for most trim. The negatives in my mind are, made in china not quite as robust as its made in Taiwan big brother, finicky to adjust bevel if stops are out, 11 1/4" cross cut (12" would be nice), no cord option especially when set up with a vac, poor dust collection, too much play in slides in the full back postion, miter lock not as solid as others. I have returned three of theses, one had a bad arbor bearing, one blade not parallel to slides, and one the slides rocked slightly in the bearings. I bought the dewalt flexvolt. I think its a good saw for quick light weight work but not scms full time replacement. I am sure others may have differing opinions. The other day tool sale with factory reps. I was talking to another old boy who was buying one. Started walking through all the features of it. Next thing I know the factory reps were asking me questions about the saw (blink) you guys don't know? Showed them about five things they didn't know or couldn't figure out......disheartening. yea, I sell tools for the reps all the time. The reps are usually salesmen. Most of them have never used the tool in any capacity if at all. I also have an issue with the 5 3/4" vertical capacity claim. I can't cut 5 1/4" baseboard in a vertical position on a 45 mitre. That seems pointless to me. 5 1/4" baseboards are very common for the work that I do. The only thing I can think of is to lay the trim flat and cut it on the 45 bevel. I just don't like doing it that way. Having serious thoughts about giving the Dewalt a try (but I am heavily invested in the M18 platform). This saw just got slammed in the new Fine Homebuilding. Apparently too much flex in the rails for their satisfaction. And other design issues the reviewer was not fond of. I haven't had a chance to see one of these out of the box. I was hoping it would be a winner. I just picked one of these up in the clearance bin at the depot. 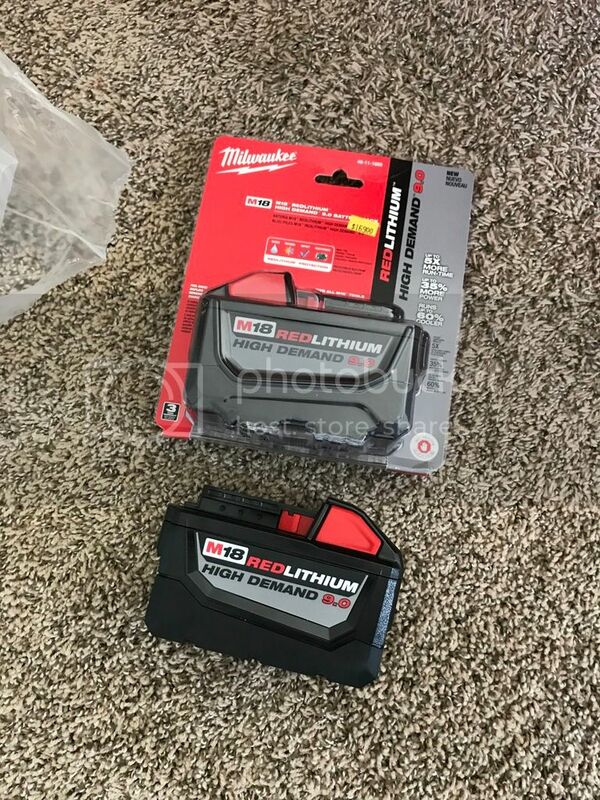 After the clearance price and a coupon I paid 530 and it came with 2 9.0ah batts. 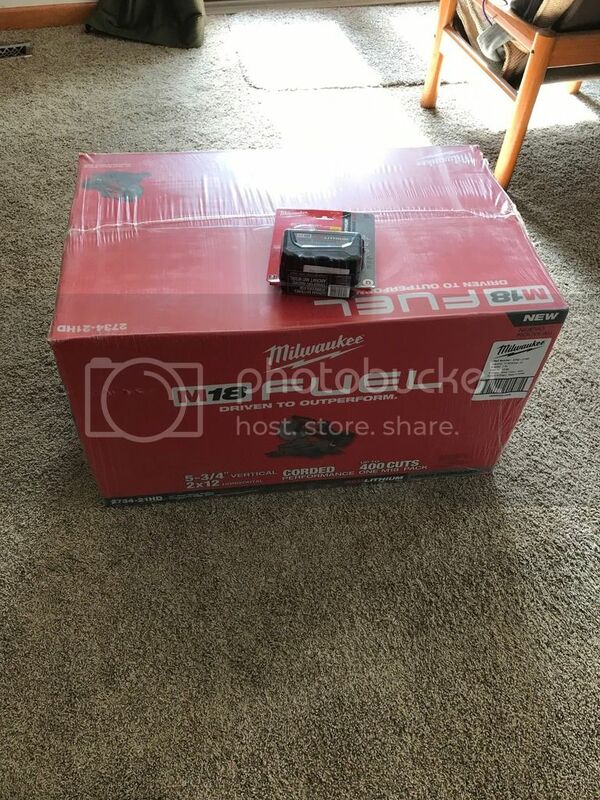 I've got the ridgid and dewalt 7 1/4 cordless saws but missed my 10" and was looking to get into some milwaukee tools anyway. Well see how it does. I have it. It has an uncomfortable amount of flex, but then it seems to cut dead nuts on. Battery life is a month with the way I use it on remodels. 200 studs in a basement is maybe 1 bar of battery. Blade light is great, like the DeWalt. I already broke the light switch, I think when it crashed off the van shelf when I was going around the corner after I forgot to lash it down. Light still comes on when running the saw though. Just being cordless is awesome, and it was a great way to add a couple 9.0 batteries to my arsenal. 3 days ago it was $100 off at Home Depot for a 1 day deal. That might happen again. Bump this thread. Going to pick this tool up tomorrow I think. Trying to cut the cord on every tool I need at the job site. Miter is on the list. From those who have it, do u still like it? Well it the bullet and got myself one! Got an extra 9 amp hour battery as well! I would call around to your local Home Depot stores for pricing. I just bought 2 of them for $350 each on clearance. Over half of the stores in my area have them on clearance for $350.